Viral respiratory tract infections and factors that make the patient susceptible to them. I have a particular interest in the role of rhinovirus, influenza and other common respiratory viruses and how they effect the human host and their immune response. My group has developed expertise in identifying respiratory viruses in airway secretions and developing an in-vitro cell culture model of infection. The role of the airway epithelium in innate immunity and inflammation in the context of asthma, COPD, cystic fibrosis and bronchiectasis. My group has developed expertise an in-vitro cell culture model of the airway epithelium with primary cells grown at the air liquid interface (ALI). The role of airway inflammation in asthma, COPD, cystic fibrosis and bronchiectasis with a specific interest in determining different inflammatory phenotypes (subgroups) in these diseases and how this may influence treatment. Assessment, characterisation and management of difficult airways disease. This includes severe asthma, but I am interested in extending this approach to COPD and bronchiectasis as well. How host immunity influences responses and susceptibility to respiratory virus infection. We have studied this in the context of pregnancy, asthma, COPD and now cystic fibrosis. I have always wanted to understand the mechanisms behind what happens in disease and why. Through this appreciation I want to be able to lead to changes that will matter for improving health. I would love to solve the problem as to why people with asthma and COPD are susceptible to the effects of virus infection and correct this. I also want to find a way of predicting who with cystic fibrosis will lose lung function and prevent this from happening. Professor Peter Wark is a senior staff specialist in Respiratory and Sleep Medicine at John Hunter Hospital, and a conjoint Professor with the University of Newcastle. In addition, he is Co-Director of the priority research centre for asthma and respiratory disease at the University of Newcastle and a member of the Vaccines Immunology Viruses and Asthma (VIVA) research group at HMRI. Professor Wark was among the first to demonstrate that viral infection was the most common trigger for acute severe asthma in adults and showed that there was a direct link between viral infection and more severe acute disease. He then demonstrated that bronchial epithelial cells from asthmatics had a deficient innate immune response to infection with rhinovirus (the common cold) with reduced release of a key immune response molecule, interferon (IFN)-β. The seminal finding that asthma can be associated with impaired interferon responses to rhinovirus has led to an international randomised controlled trial of the effect of nebulised IFN-β on acute asthma. More recently, Professor Wark has established a direct link between uncontrolled allergic inflammation and impaired antiviral responses in asthma. He has led a team that established an important role of innate epithelial cell responses to influenza and shown this to be impaired in chronic obstructive pulmonary disease (COPD). In addition, he has been part of a team that has investigated the mechanisms behind the susceptibility of pregnant women to influenza and other viral infections and determined that a placental derived protein is responsible for impaired immune responses and exaggerated inflammatory responses. 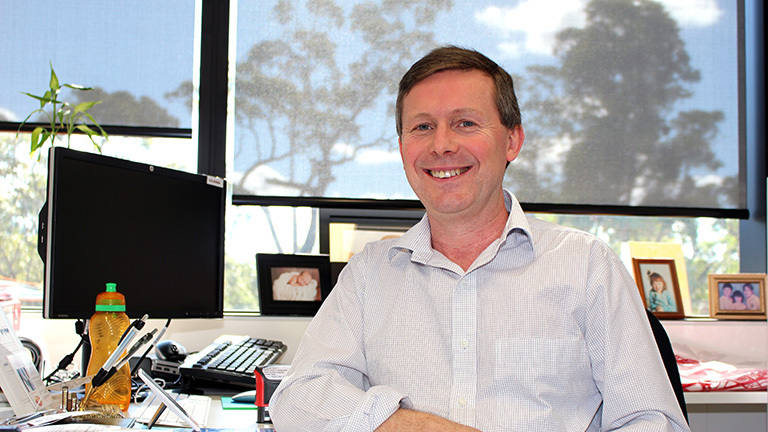 Finally, Professor Wark is currently investigating whether an inflammatory gene signature can be found in patients with cystic fibrosis that will predict loss of lung function. My ultimate aim is to determine why patients with asthma and COPD are susceptible to infection with respiratory viruses and then find ways that will reverse this. Respiratory viruses are the most common reason for acute attacks of asthma and COPD from young children to the elderly. These acute attacks are responsible for considerable morbidity, may result in hospitalisation and even death. Clinical characterisation of patients with asthma, COPD and bronchiectasis - This is with a special emphasis on the role of phenotyping based on airway inflammatory patterns. Expertise in identifying respiratory viruses in airway secretions and developing an in-vitro cell culture model of infection. Expertise an in-vitro cell culture model of the airway epithelium with primary cells grown at the air liquid interface (ALI). Thoracic Society of Australia and New Zealand and was an executive member, and a member and former chairperson of the clinic care and resources subcommittees. Ussing chamber apparatus to measure barrier ion flux/permeability across multiple tissues in vitro. This includes 4xUSS5SD and USS4SD USSING SYSTEM W/DRAIN, with the EVC4000-4 PRECISION V/I CLAMP 4 CHANNEL voltage/current clamp, 505063 Circulating Water Bath 13L 230V 50HZ, and LAB-TRAX-4 DATA ACQUISITION SYS 4 CHANNEL. An acute exacerbation (also known as infection) is a critical event for a CF patient.